The carrying capacity of the pipeline depends on the diameter and the Hazen-Williams C-value, which is proportional to the smoothness of the interior surface of the pipe. 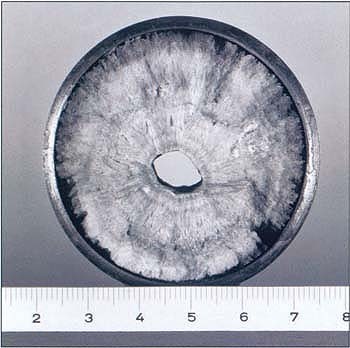 Due to deposition of solids with time, the interior surface may be deteriorated and incrusted; in effect the diameter of the pipe and the Hazen-Williams C-value get reduced. The reduction in diameter and C-value causes increase in frictional loss and is reflected in the gradual reduction in carrying capacity of the pipeline and reduction in tail end pressures. The distribution system is generally designed as a continuous system for a peak discharge. The peak discharge is the average hourly discharge (total daily demand divided by 24) multiplied by the peak factor, which is likely to occur during the peak hours. The peak factor is assumed as 2 to 3. But most of the distribution systems are operated as intermittent system, with supply duration ranging from 2 to 8 hours. The daily requirement is to be distributed within this duration of 2 to 8 hours, which means the actual discharge in the main is 1.5 to 4 times the design discharge. Due to this high discharge also the frictional losses in the system increase resulting a reduction in residual head at tail ends. To avoid this condition the distribution system should be designed as intermittent system adopting suitable duration of supply and the average flow during the supply period.